We are pleased to announce the update for Shift v2.1.0, our diatonic granular pitch shifting effect, is now available: download it here. 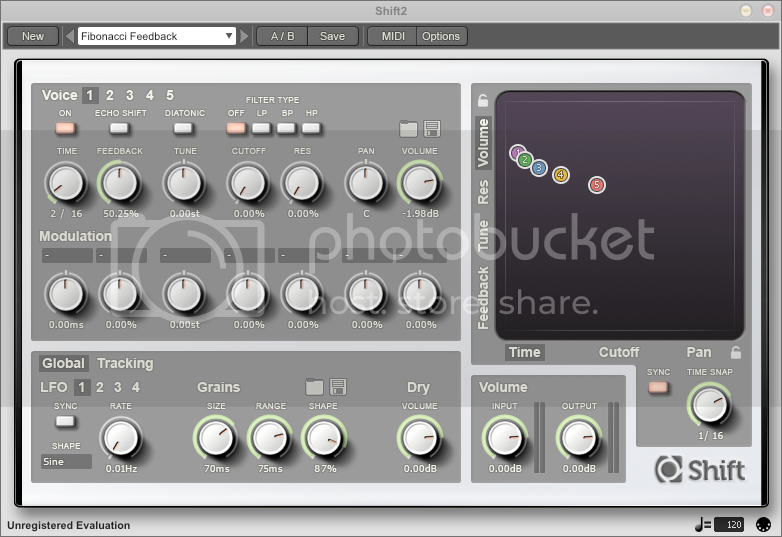 Shift v2 is available for Mac OS X, Windows, and Linux, in Audio Unit, VST, RTAS plug-in formats, as well as in standalone application format. Native Linux 64-bit standalone application and VST plug-in. Fixed audible click and DC offset which could occur (albeit very rarely) when changing between certain presets. Fixed issue that could cause some presets to be instantly marked as changed after opening them in Pro Tools on Mac OS X.
Presets can now be quickly grouped using categories. Windows installer now uses the correct admin privileges. This fixes an issue where Vista or Windows 7 could complain that Shift may not have installed correctly. Windows VST 32-bit plug-in and standalone applications no longer depend on additional runtime libraries. However, these libraries are still required - and installed - for the RTAS format plugins. Filter types are now labelled Off, LP, BP, and HP. Minor visual improvement to interface button controls. All presets from Shift v1 are now included (and in many cases improved) in factory preset library. Preset loading speed is improved when using MIDI Change Program messages. PDF manual now contains description of Echo Shift function. Native 64-bit VST plugin and standalone application for Linux. Integrated Preset Browser, with meta-data, tags, searching, and hot-swap support. Additional presets. All presets now tagged and annotated. Presets can now be sorted using auto categorization. String Instrument and FX now have their own individual default preset. CPU usage is now consistent when using the Mac OS X RTAS Plugins. Windows VST 32-bit plugins and standalone applications no longer depend on additional runtime libraries. However, these libraries are still required - and installed - for the RTAS format plugins. libjack is now weak-linked for standalone Linux. This means JACK is not required (but still recommended). Fixed slight pitch shifting timbre that would rarely occur when quickly swapping between presets using different delay time settings. This finally sees our entire current product line now using the vastly improved integrated preset browser. String is also the first to have a new preset browser feature: Categories. Categories are a nod to those people who have expressed a liking for the old preset system, saying it was a lot easier to find all the (for example) bass presets. Of course, you could always enter 'bass' into the search area, but who wants to be typing when you're on the verge of creating a timeless bassline? Categories are user creatable search terms that, for quick access, appear in the browser tree. Anything you can search for can be used as a category: so you can even categorize by preset authors, or indeed any tag or descriptive word. And provided you've tagged all your presets correctly, they'll automatically appear in the correct category (or categories). 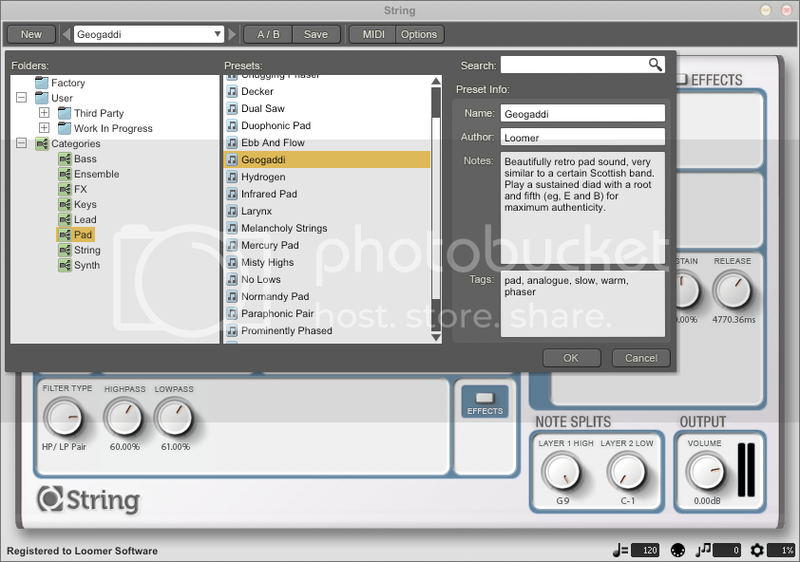 String 1.2.3 is available for Mac OS X, Windows, and Linux. Download the update here.